This blog explains the seven steps to producing a Photostory about leadership. A Photostory shares a message using only images. The individual images are sequenced together to produce a video. A Photostory can be time consuming to complete. You should allocate roughly eight classes. This year the school launched a leadership initiative based on the Seven Habits of Highly Effective People by Stephen Covey. To help students learn more about the habits the Grade 2 students created a Photostory. In each photo, a student held a sign they had created to promote leadership. These images were sequenced into a video that played on the television screen in the front foyer of the school. Students learn how to use cameras to take high quality photos. Tripods: To ensure the safety of the school’s camera equipment, inexpensive tripods can be purchased from a local discount store (for only $10). Often inexpensive tripods are not very tall, which makes them the perfect height to mount cameras for use by Grade 2 students. Tripods also add a professional touch to the assignment, encouraging students to recognize the value and significance of the task. Recruit Volunteers: Students will need extra support during this practice activity. Ask a parent to assist during this lesson. Team Up: Students need to be divided into teams. Now is a good time to provide tips for collaboration. Observe how group members interact. If necessary make adjustments now, as teams will be working together for the remainder of the project. 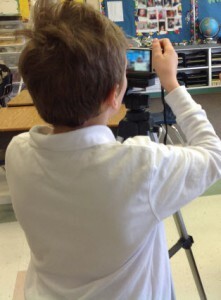 Student Driven: Begin the lesson by modelling how to use the cameras. Be clear on your expectations for proper care. Now step back. Give your students a chance to become photographers. Encourage students to direct models (other team members) on how to pose. After several photos are taken, students should switch roles. Celebrate: After class (during a break or at the end of day), transfer images from each camera into a folder. Show students the collection of photos. Everyone will enjoy seeing pictures of themselves and their friends. Students have a planning meeting. Which of the seven habits should we choose for our topic? What unique message can we each create related to the leadership topic? Where is the best location to shoot photos of the leadership signs? Are any props or clothing required to help communicate the leadership message? To help students prepare I sent a letter home informing parents about the Photostory. A request was made to remind students about the props they may need to bring in for the photo shoot. For example, the group that had selected synergize had decided to wear sport team jerseys and bring in trophies they had won. You may also want to send home a parent letter. 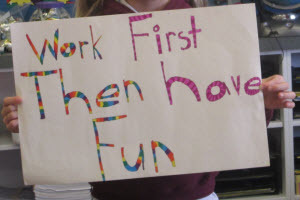 Gather Materials: Decide if your students are going to paint, draw, or use the computer to create their signs. Once a decision has been made be sure to gather the necessary materials or schedule computer lab time. Check Spelling: You do not want any spelling mistakes in the signs. Be sure to proofread each student’s sign before they apply paint, start to color, or print. Student-photographers direct the photo shoot. Recruit Volunteers: Have parent volunteers assigned to each group. Since this is a leadership based activity, the majority of decision making and time management strategies should be student-driven. However, having an adult available to assist group members is a good idea. You may want the parent volunteer to carry the equipment to the photo-shoot location to make sure that it is secure during transit. Please note, photos should be taken by student-photographers. Allow Preparation Time: Students may need time to change their clothing or gather props. Allocate time prior to the start of the photo shoot. This will make sure that everyone is prepared. Take More Than One Shot: Have student-photographers take three to four photos of each model. This will allow the person to select the image they like the best. Transfer Photographs to a Shared Folder: Each group needs access to their photos in the following class. Copy the photos from each camera’s memory stick into a group folder that students can easily access. Have a Sign that is Easy to Read: The leadership message should be clear. No letters should be covered. Include a Clear Shot of the Model: The face of the student-model holding the sign should be viewable. It is best if they have a happy expression. Have a Neutral Background: The background should not attract attention. The focus should be on the sign. Students can use a range of software to sequence images together to produce a photostory. MovieMaker and PhotoStory are two options. For this leadership activity PhotoStory was used. This software was selected because the computers were still using Windows XP (NOTE: Although originally designed for Windows XP, PhotoStory does work on both Windows 7 and Windows 8 computers) AND because the software has a Motion option that makes it easy to zoom in or out of the leadership message. Click Begin a new story. Click Next. Click Import Pictures. Select the pictures for the PhotoStory. Click OK. Click Next. Click the first picture. Click Customize Motion. Click the Specify start and end position of motion checkbox. Resize the box to go around the leadership sign in either the Start or End position. Set the duration to 8.0 seconds. Set the Motion option to focus on the leadership sign. Click the Go to Next Picture arrow. Use skills to apply custom motion to EACH picture. Click Close when finished. Click Next. Select music or skip this step. Click Next. Select a save option such as Save your story for playback on your computer. Click Next. Click View your story to watch the video. Save the project, then click Exit. How did students stay organized? How did working as a team make the activity easier? This activity took several weeks to complete. When the videos were complete, a master file was created and played for all students in the school on the television screens in the front foyer.